This assortment of cards was created to celebrate partnerships, friends, and relationships. Each one was designed to feel warm and welcoming, with a tone reflecting the year. Meant to stand out in a sea of holiday mail, interesting folds and cut-out details, textures, and messages were created to make each one feel like a tiny gift. They were created collaboratively, with individual designers contributing elements and riffing on each others’ work, and poetry selected to compliment the visual messages. Offset printed in 4-color process inks on bright white, matte coated cover stock. Invitations (above) to a year-end celebration at the Portland Art Museum played on the idea of a frame, trimming the word “art” from the word “party” in a cutout placed between letters in the word “happy” on the outer card. Quotes from Sister Corita Kent (artist and designer), Daniel Barenboim (pianist), and Andy Warhol (artist) reinforced the theme of art and this moment to celebrate together. Letterpress printed in metallic blue and silver inks on chocolate cover stock, and metallic silver and chocolate inks on silvery blue Stardream cover stock. a clever reference to the year behind us. It offers perspective: we will grow and thrive, while carrying it with us. Offset printed in one flourescent color. 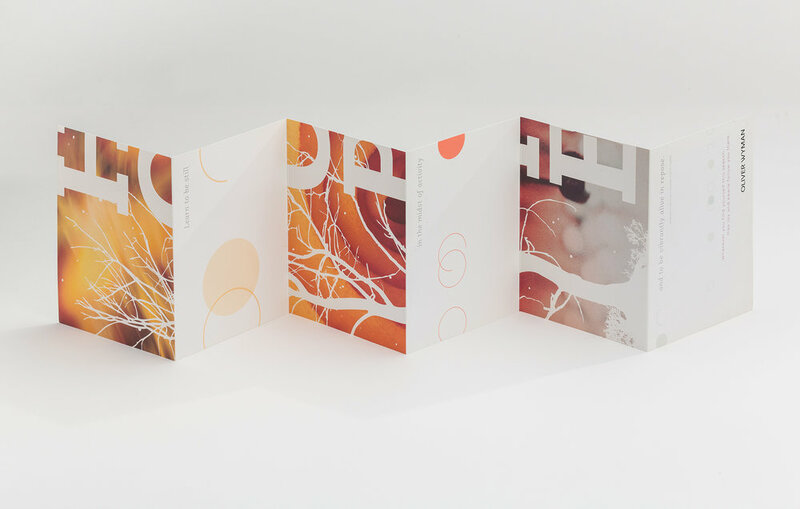 This invitation design (left, above) for a Monte Carlo-themed party reflected art deco details of the space where the party would be held, also inspired by luxe textile design from Monaco. Printed in 2-colors, metallic gold (letterpress) and wine red (offset), on bright red and mango uncoated papers. Printed in 4-color process inks on matte coated, bright white paper with tinted spot gloss varnish. Cutout revealed interior text, to play back and forth with the ideas of reflection and revelry. Visuals were inspired by forms of musical notation and instruments, in shades of blues inspired by the jazz band who played for the celebration. Letterpress printed in chocolate and periwinkle blue inks on bright white, coated cover stock and in opaque white, periwinkle blue (offset) and silver (letterpress) inks on navy blue uncoated cover stock. Card was printed with copper and clear, bright red inks, plus a spot gloss varnish on coated, bright white paper. The textures and organic forms built on ideas of growth beyond constraints, creativity and structure.